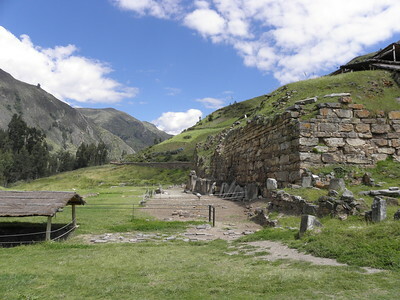 The archeological site of Chavin de Huantar was a sanctuary and pilgrimage site of the culture of Chavin, one of the ancient civilizations of South America that existed between 1500 and 300 B.C.. 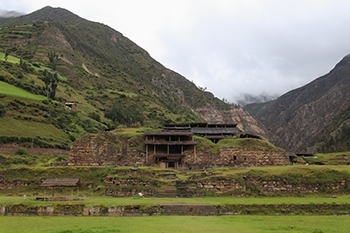 This ceremonial center is located at an altitude of 3,177 meters in a high valley in the Andes. The complex consists of temples, a number of terraces and squares and a network of underground galleries. There is a massive central square, with underneath it a well-engineered system for drainage. The Castillo is the main temple, with three levels of dry stone masonry. On the outside it was adorned with sculptured cornerstones - the famous "Cabezas clavas" of which one is still in situ. Furthermore there are zoomorphical bas-relief sculptures and sculpted megaliths: the Lanzon, the Raimondi stele and the Tello obelisk. Pottery with religious offerings inside was found, including shells and carved bones. I visited Chavin by public transport from Huaraz. It takes 3.5 hours via a mountain pass across the Cordillera Blanca. You will also pass through the Huascaran National Park (another WHS) en route. When the bus is approaching the village of Chavin, you have a great view on the archeological complex that is pasted to the mountain. Although it is mostly known for its underground galleries, the sight of the main temple in its natural setting was a pleasant surprise to me as I had never seen photos of the complex. I hired a guide to show me around (5 EUR, only in Spanish). The main structure consists of a grand pyramidical temple with a rectangular square in front of it. It was at this square were the religious ceremonies were held that the pilgrims came to attend. It is layed out almost like a modern day stadium, with rows of stairs on the sides to sit on and watch the spectacle. The site has suffered from a landslide and an earthquake, so some of it is not in the original location. Large sculpted stones are scattered over the area. Replicas of the Raimondi stele and the Tello obelisk can be seen. A few things have survived in situ however: the Lanzon, a fine sculptured monolith hidden in a gallery, and one of the cornerstones in the shape of an anthropomorfic figure at the outside of the wall. The guide pointed out the large noseholes and wide open eyes in the sculptures - evidence of the use of hallucinational drugs. The site is also high on symbolism (the number 7 keeps recurring) and astrological features. The originals of the archeological findings are nowadays located in a new museum in Chavin. This museum is impractically located on the other side of town along the main road, about 20 minutes walk from the Plaza de Armas. It is an enormous modern building, constructed with Japanese help. There are relatively few artifacts to be seen despite the size of the building - I was in and out in about 20 minutes. Their quality however is extremely good: sculpted Strombus trompets, the Tello obelisk and the Cabezas clavas. Site visited April 2018. After some more touristy sites in Peru, visiting Chavín was a pure pleasure: no crowds, souvenir sellers, touts and high entrance fees – just greenery, fresh mountain air, few tourists and, of course, a great site with nice museum. Chavín de Huántar is located at the foothills of Cordillera Blanca mountain range at an elevation of 3200 metres. There are buses from Huaraz that take about three hours. I had a bit of travel fatigue so I decided to take a private transport. I negotiated a fairly good price with hotel staff. It took about two hours from Huaraz with a 4x4 vehicle which was a good choice because the road was in a quite bad condition at times. The highest point of the mountain road, the tunnel of Kahuish, is at 4500 metres. On the way to Chavín we made some short stops. One of the obvious stops is Lake Querococha which is a part of Huascaran National Park WHS. When I entered the site it started to drizzle but it didn’t spoil my great mood. I paid a modest 15 soles entrance ticket and had a view around me. At first I wondered where are the temples and all but after a while I realised that I was at the backside of the site. The first overall feeling of the site is s bit shabby. There were some negligent roofs and scaffoldings that protect the ancient structures. River flows just beside the site so you could hear the sound of rushing water all the time. I felt almost like having the whole site for myself because there were only 10 other visitors. Chavín is the greatest achievement of the Chavín culture which is the oldest major culture in Peru. The site itself consists of four temples and three squares in front of the temples. The main temple, temple A or ’El Castillo’, is pyramid like building that was finished around 800 BC. It includes the oldest constructions of Chavin and it is built in many phases. Around the upper part of the temple A used to be the famous stone sculptures or tenon heads representing human faces with feline features. Today only one head sculpture exists on the backside of main temple. Rest of the remaining sculptures, about 30, are on show in the Chavín museum. Underneath the main temple are many maze-like underground galleries. Some of them are connected with each other and some of them are separate. The tunnels are dark but dim LED lighting make exploring easier. Beside the main temple and between two bigger temples is small temple that contains so called Lanzón which is large carved stone idol. Unfortunately it was not possible to visit that gallery at the time of my visit but replica of it was in the museum. One of the most amazing features of Chavín is so called Black and White Staircase in front of the temple A and Portal of the Falcons above the staircase. Both of these ceremonial constructions are built with half black and half white stone. Black (north) and white (south) probably refer to the duality of Andean cosmology. Black and white colors of the stones are barely perceptible any more but it is possible to see some lighter and darker hues. Portal of the Falcons consists of carved columns and lintels. On top of the columns are feminine and masculine characters. Underneath the lintels are 16 carved falcons. Worth mentioning is the Chavín museum (Museo Nacional de Chavín). It is easy to miss because it is located two kilometres from the site. The museum building is new and modern and it is funded partly by Japanese government. The exhibition is compact but it gives you better insight to Chavín site and culture. There are lots of artefacts from the site, the most famous of which are the tenon heads that used to be on the walls of the temple A. One of the highlights is the so called Tello Obelisk with animal carvings. There is also a great collection of conch shells which have been used as trumpet for ritual purposes. I was really happy with my visit in Chavín. The site is compact enough to see and get a good understanding in two hours. The setting is beautiful and the site has some good information signs for independent travellers. And the museum was the cherry on the cake. For me Chavín was literally like a breath of fresh air among otherwise hot and hectic places in Peru. Chavin de Huantar is a very interesting site depicting the eponym civilisation that flourished in this part of South America between 1500 and 500 BC. The most incredible part was the series of tunnels dug under the site with their particular shape and ceiling offering magnificent perspectives and showing the creative and technical genius of the Chavin culture. It is worth to visit the museum of the Chavin culture, located close to the site and having large collections of sculpted elements. I am delighted to be the first to review this magnificent world heritage site! To say that this place was a pleasant surprise was a massive understatement. Chavin is still shrouded in mystery. Archeologists seem to have only a small idea of what the place was used for, so I will not comment on its origins. At first glance, it appears that there is little to see here, but a little exploration of the site soon reveals a beautiful 'courtyard' and water 'tank'. These are only the start though. Much of the site is underground, and soon you find yourself in bizarre chambers and galleries. The entry fees are only about $4, and it is worth every penny. A real pleasure to visit, that should not be missed by any archeology fan!